The front staff was really great and friendly. I was sent back to the room to wait for the doctor ina timely manner. The first individual who saw me was very nice and just did the standard weight and blood pressure checks. I then waited for the doctor for about 15 or 20 more minutes. Dr. Feldman seemed rushed and did not seem interested about me as a person. She was typing away on her laptop the entire time and just asking basic questions. I felt like a number and not an actual person. The appointment was very disappointing and I left feeling very discouraged. I will not be back. The front staff was really great and friendly. I was sent back to the room to wait for the doctor in a timely manner. The first individual who saw me wasvery nice and just did the standard weight and blood pressure checks. I then waited for the doctor for about 15 or 20 more minutes. Dr. Feldman seemed rushed and did not seem interested about me as a person. She was typing away on her laptop the entire time and just asking basic questions. I felt like a number and not an actual person. The appointment was very disappointing and I left feeling very discouraged. I will not be back. The office personnel were very friendly and efficient. Dr Feldman was in tune with the objective of the visit and waseasy to talk to. Dr. Irene Feldman is a board certified physician in internal medicine and endocrinology/diabetes. She's been in private practice for more than 15 years. Dr. Feldman was chosen as a Top Endocrinologist in 2010 in the Washingtonian magazine. 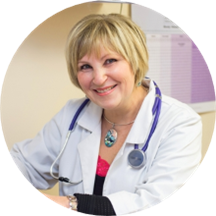 Dr. Feldman is a Russian speaking physician, who received her medical degree and training in Moscow, Russia. She came to the United States in 1989. After passing all her certification exams, she did her internship and residency at Washington Hospital Center, DC from 1991-1994. Afterwards, Dr. Feldman completed her fellowship in endocrinology and metabolism at George Washington University Medical Center from 1994-1996 and joined Dr. Galotto's practice. In addition to working at Dedicated Medical Care, she's actively teaching a monthly Johns Hopkins diabetes course at Suburban Hospital, lectures on different health topics at senior centers and retirement communities, and is a volunteer physician for MobilMed where she provides free treatments for patients without insurance. I waited over 90 minutes and then she basically dismissed me. It was a good initial consultation. I will be able to give more feeedback upon the labs review.